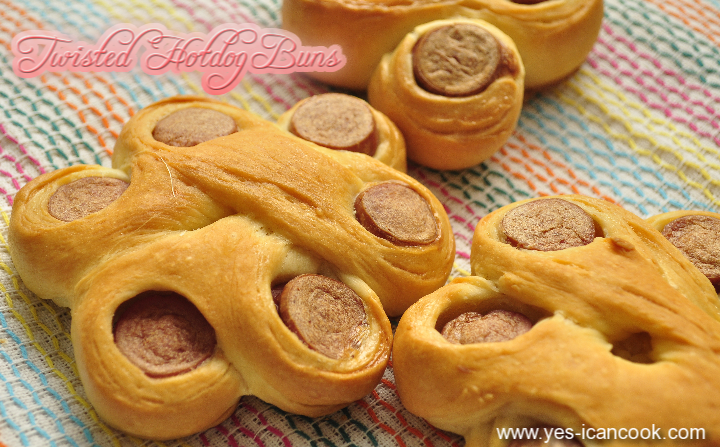 This is such a wonderful way to make hotdog buns and they look so pretty too. You can look at them, admire them and then bite them. Perfect with that evening Tea or coffee or anytime of the day. 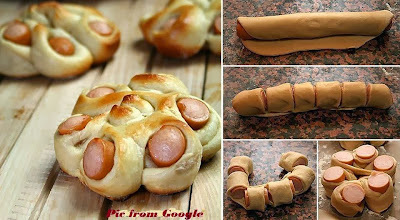 This is the picture that inspired me to try out the recipe. Crunchy on the outside and soft on the inside. The bite with the piece of sausage is a bonus. These can be made plain or can be topped with herbs and spices, finely chopped vegetables and cheese. 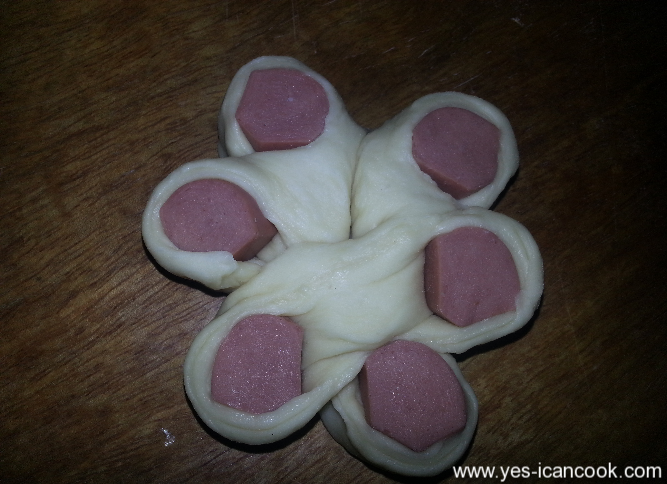 Makes 2-3 buns depending on the size you make. 1. Take a mixing bowl and add the flour, milk powder, instant yeast, salt and sugar. Mix these with a spoon so that they are well incorporated. 2. Add oil, egg and then start adding warm water little by little as you knead to form a soft dough. 3. Remember that the water should be warm and not cold or hot. If cold the yeast will not work and if hot the heat will kill the yeast. Test water by dipping your finger and it should be bearable. Tip : I microwave the water for 10-12 seconds to achieve the temperature. 4. Knead well for 8-10 minutes. The more you knead the more soft the bread will be. 5. Dip your fingers in some olive oil and apply it all over the dough. 6. Place it in the mixing bowl and cover with cling film. You can also use a kitchen towel. 7. Keep it aside to rest and rise for 1 hour. Make sure you keep it in a warm place and not in an air conditioned room. Tip : Here is what I do, take water in a microwave safe bowl and bring it to a boil in the microwave. I microwave on high for 3 minutes. Move the bowl aside and place your mixing bowl with the dough covered with the cling film and cloth and close the microwave door. make sure you have shut down the microwave. open only after one hour. This creates a perfect warm temperature. 8. Thaw the hotdog sausages. 9. After one hour, the dough would have risen to double the quantity. 10. Punch down the risen dough and just knead it for a few minutes. It returns back to almost original size. 11. Divide the dough to 2-3 portions. Smooth each portion into a ball between your palms. 12. 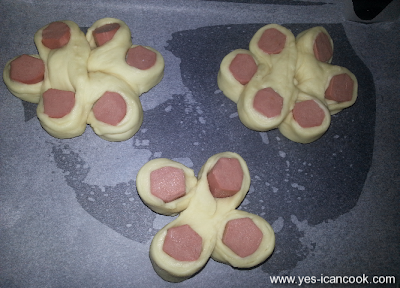 Using a rolling pin roll each portion of the dough into a disc by dusting flour as needed. Roll it to a circle, oval or rectangle or even square. 13. You can brush some butter. I did not. You can also dust some spices. 14. 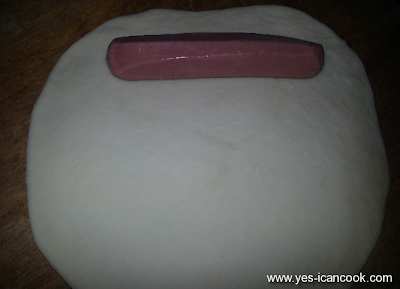 Place one thawed sausage on one side of the rolled out dough. 15. Start rolling the dough with the sausage enclosed to form a cylinder. 16. Place it with the smooth side facing up. 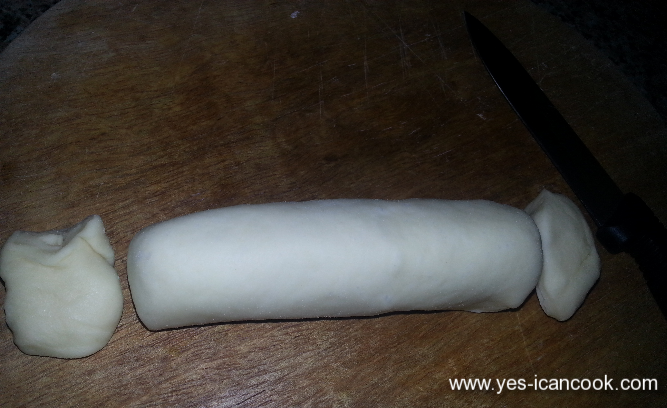 With a sharp knife cut and discard the extra dough on the sides if you have any. 17. Next make equal spaced 5 slits on the cylinder. 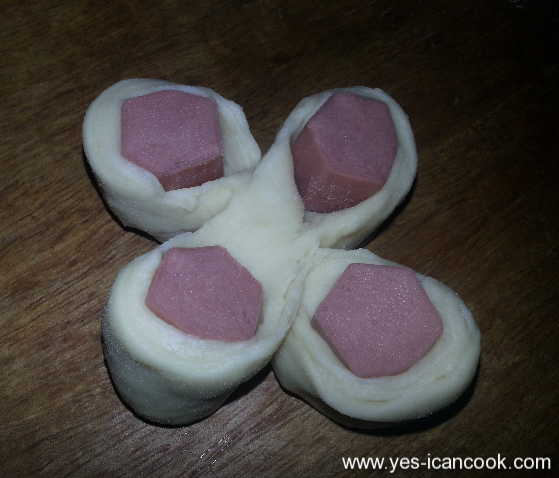 Make sure you do not cut the bottom portion of the dough. Be careful. Ignore the additional small slits you see. I miscalculated a bit. 18. Form a U shape with 2 slit pieces on each side of the U. 19. Now this next step is very easy to do but confusing to explain. I will try my best to put it in words. Place one open side of the U over the other open side of the U. Then twist the dough such that the sausage piece shows up and form a flower shape. 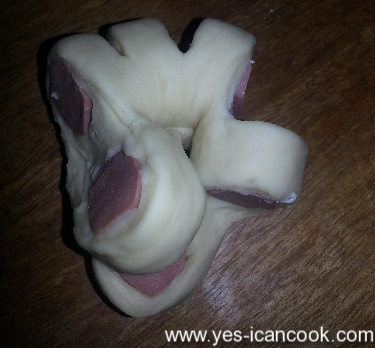 You can twist and form any shape. 20. 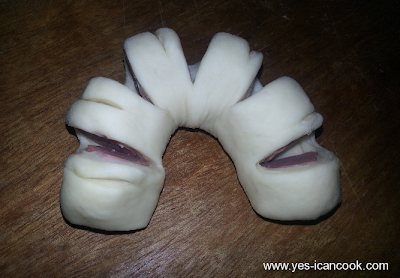 I made 3 slits and twisted one bun into a diamond. 21. 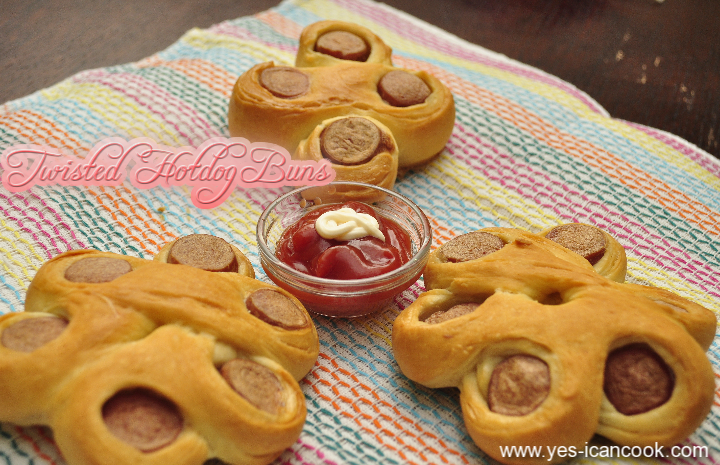 Place the prepared buns on a greased baking tray or a tray lined with parchment paper. 22. 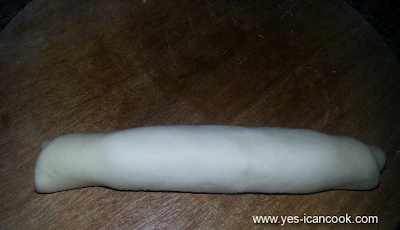 Cover loosely and keep aside to rise again while you pre heat the oven to 200 C.
24. Top with Finely chopped vegetables, cheese or herbs and spices of choice. I baked them plain. 25. 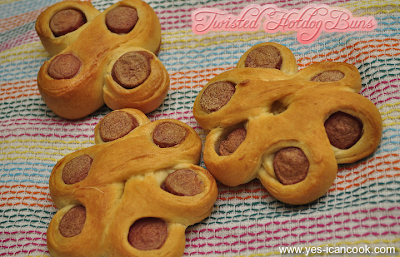 Bake for 15-25 minutes depending on your oven. Mine were done in 18 minutes. I reduced the temperature to 180C at 15 minutes. Recipe inspired by a picture posted on the Facebook Page It's All About Seem's Food. Mashallah kisi ki Nazar nalagay. Keep it up. I made this and it was yummmmmm! Who can ever forget those camping days when all you want to have as your snack is that one big piece of hot dog? Who can ever forget the time when all you ever want to experience in your date is that tasty hot dog on a stick, shared with your special someone? American loves the hotdog, sales prove it. It has a history that is long but it is also the personal experience that keeps it endeared to Americans.